On Saturday night Eddie Hearn’s latest acquisition, Daniel Jacobs, will be on display on HBO. He will be facing Luis Arias in the main event of the evening. 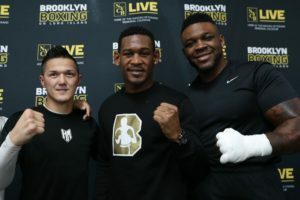 Two other bouts are also planned to be broadcast, a heavyweight fight between Jarrell “Big Baby” Miller and Mariusz Wach in the heavyweight division and a junior welterweight bout between Cletus Seldin and Roberto Ortiz. The NYCB Live, Home of the Nassau Veterans Memorial Coliseum in Uniondale, New York will be the host site for Saturday’s boxing card. The following is a preview of Saturday’s HBO card. The opening bout of the night will be between Cletus “The Hebrew Hammer” Seldin and Roberto Ortiz in the junior welterweight division. Seldin is a local fighter with a large, supportive fan base. He’s fought in New York for most of his career with a large majority of his fights taking place at the Paramount Theatre. He’s undefeated, but he is currently thirty one years old and his window of opportunity for a legitimate world title fight is getting smaller. His opponent Roberto Ortiz is the same age and has fought mainly in Mexico. He fought one time in the United States and was stopped by Lucas Matthysse. Ortiz will have a slight two and a half inch height and reach advantage. Neither Seldin or Ortiz has a notable amateur background in boxing. However, Seldin does have experience in wrestling and judo. He also was a finalist in the New York Golden Gloves tournament. Both boxers have decent power. Seldin has sixteen stoppage wins on his resume while Ortiz has twenty six. Seldin has never tasted defeated while Ortiz was stopped in his one fight against a big name opponent. Neither boxer has any big name victories. Seldin’s best wins were against Jesus Selig, Johnny Garcia, and Bayan Jargal. Ortiz’s best wins were against Reyes Sanchez and John Aparicio. This is an excellent test for Seldin and it will be the toughest of his career. Ortiz has a good record, but lost the only fight in which he faced a good opponent. Seldin should be able to win a close victory, but we’ll definitely have a better idea if he’s a legitimate contender on Saturday night. Jarrell Miller is an intriguing heavyweight prospect in that he has experienced some surprising success in another combat sport, that being kickboxing. He was able to defeat UFC veteran Pat Barry in a kickboxing match and went 19-0 in Muay Thai before going to kick boxing. He found some success in kickboxing’s prestige league, K1, and lost to UFC veteran Mirko Cro Cop twice by decision. He has been very successful since switching to boxing. He’s undefeated and has seventeen stoppage wins, including eight stoppage victories in a row. He fought once in 2017 and three times in 2016. Miller does have some amateur boxing experience. He made it to the finals of the New York Golden Gloves and lost to Tor Hammer on points. His opponent, Mariusz Wach, also had a successful amateur career and was a Polish National Champion and an Olympic alternate. Miller will have an eight year age advantage on Wach, who is currently thirty seven years old. Wach will have a height advantage of about three and a half inches and a reach advantage of four inches. In addition to being tested as a kickboxer, Miller also has defeated some notable heavyweights. His notable wins include Gerald Washington, Fred Kassi, and Donovan Dennis. Wach’s biggest wins have come against Tye Fields, Kevin McBride, and Jason Gavern. His losses were to Alexander Povetkin and Wladimir Klitschko. Wach’s age and relative inactivity is a concern. He fought only once in 2017 and once in 2016, against less than impressive opposition. There’s been a lot of talk recently about a potential heavyweight fight between Deontay Wilder and Anthony Joshua, but an impressive win by Miller could result in him getting a title shot before Wilder and Joshua meet inside the ring. Daniel Jacobs earned the title of “Miracle Man” after defeating a diagnosis of bone cancer in 2011. He was previously signed to Al Haymon’s Premier Boxing Champions (PBC) but has recently decided to sign with Eddie Hearn and Matchroom Sport. Jacobs had a very successful amateur career. He was a Junior Olympics National Champion, a Police Athletic League (PAL) National Champion, and a National Golden Gloves Champion. His opponent, Luis Arias, also had a very successful amateur career. He was a US National Champion at middleweight in 2008 and 2010 and was also a Gold Medal PAL winner. Arias is twenty seven years old and three years younger than Jacobs. Jacobs will have a very sleight half an inch reach advantage over Arias. Jacobs has a large edge in power over Arias. Jacobs has stopped twenty nine of his opponents and nine of his past ten fights were TKO victories. Arias only has nine stoppage victories, but three of his past four fights were TKO victories. Jacobs has the better professional resume of the two boxers. He has defeated the likes of Ishe Smith, Jarrod Fletcher, Caleb Truax, Sergio Mora, and Peter Quillin. His losses were a close decision loss to Gennady Golovkin and a shocking knockout loss to Dmitry Pirog. Arias has defeated the likes of Arif Magomedov, Scott Sigmon, and Jorge Silva. Arias does have an edge in activity. He already fought twice in 2017 and fought three times in 2016. Jacobs has only fought once in 2016 and once in 2017. This should actually be a tougher fight for Jacobs than most expect. Arias has the amateur background to match Jacobs and he has never tasted defeat. He’s also been in the ring more often than Jacobs and won’t have to worry about ring rust. However, Jacobs was very impressive in his defeat to Gennady Golovkin and is filled with confidence. Arias has never felt the power of a boxer like Jacobs and has never been in the ring as a professional with someone of Jacobs’ caliber. This is Daniel Jacobs’ fight to lose, but Arias has enough talent to make it closer than expected.